Brand new house at storey lake. 5 Bedroom with private pool. Property Size 2,128 sq. ft. This NEW property can accommodate comfortably up to 10 people with private pool, with modern furniture and a contemporary decoration. A great private pool with enough space for a nice barbecue day! This is definitely the best option to spend some time with family and friends. Accommodates up to 10 Guests with 5 Bedrooms and 4 bathrooms. 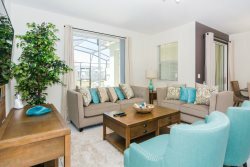 Storey Lake is a brand new luxurious vacation community located just 4 miles to the magical world of Disney and just minutes to Universal, Sea World and the many water parks in the area. Storey Lake also features a community pool, clubhouse, lazy river, restaurant, sports court, valet trash services and much more! Edson gave us excellent service. Everything was perfect. This property is better than what I was looking for. PLEASE NOTE: SERVICES MUST BE RESERVED PRIOR TO THE CHECK IN. CHECK RATES & AVAILABILITY.